We have been creating personalized cemetery markers for families since 1974 when we realized that monument companies from other towns were placing heavy pressure on grieving families to "buy now and save". We have always felt that buying under the pressure of grief is not a good decision. You will not see any "50%" off sales or any marketing tactics from us. We believe in fair prices from the start and always stand behind our products and our work, so you know that you always have someone to fall back on if there is a problem. We partner with Harrison Monuments out of Warsaw, IL and are their local representative in the Fort Madison area. Families meet here at King-Lynk Funeral Home & Crematory to design a cemetery marker instead of driving back and forth between Fort Madison and Warsaw, IL. The cost is exactly the same in Fort Madison as it is at their office in Warsaw, IL. 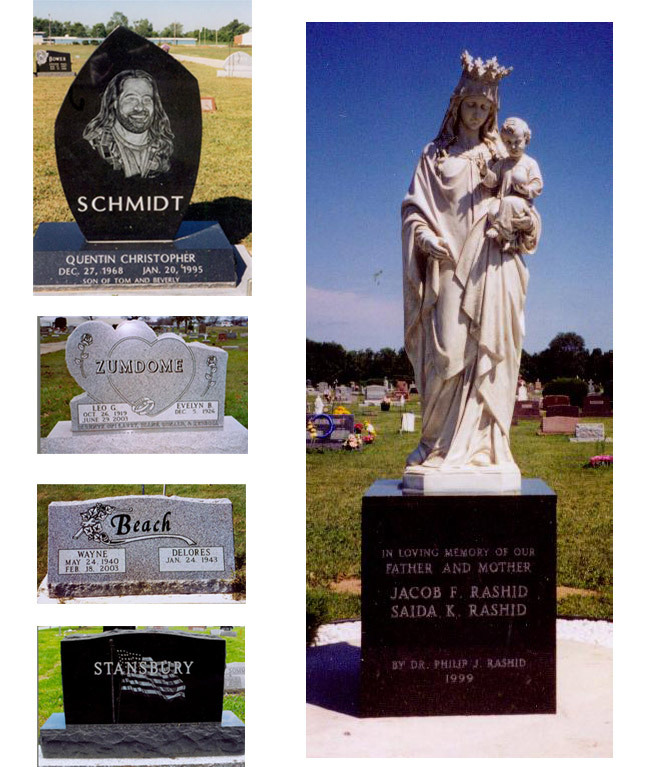 We offer virtually any type of cemetery marker that you can imagine. If you can dream it up, we can produce it. Even if you can't dream it up yourself, let us help you with finding a product that fits your budget and creates a lasting memorial for generations to come. From hand etched portraits to laser etched scenes of your family farm, favorite pet, or just a plain cross, we can produce anything that you desire.